Did you know that macadamia trees are not indigenous to Hawaii? I didn’t either until I met Tuddie,the owner of Purdy’s Farm on Molokai. 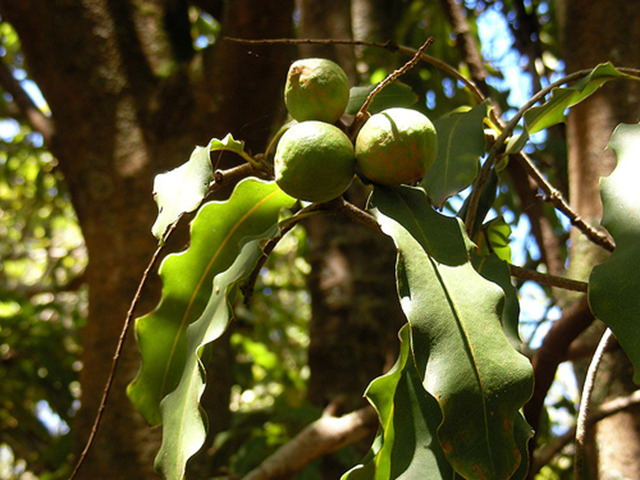 The macadamia nut tree is originally from Australia, but Hawaii is credited with creating the industry for the nut. Tuddie enthusiastically shares his knowledge about growing macadamia in Hawaii. He showed us the entire life cycle of the nut from flower to harvest. I learned that the shell is protected by an outer green husk. I also learned that the leaves of the tree are stiff and reminded me of an extra large holly leaf. Purdy’s Farm on Molokai is 2 miles west of Kalapuu on Lihi Pali Avenue. The visit is free. Their web site says they are open Monday through Saturday, but when I was there Tuddie said they are not open Sundays and Mondays. It’s a very small family run business, so it would be best to call ahead and check on their current hours. The number is 808.567.6601. 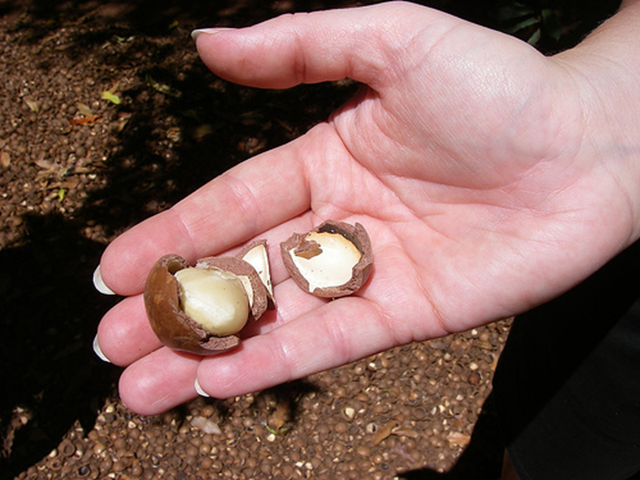 Hamakua Macadamia Nut Visitor Center also offers free self guided tours everyday from 8:00 to 5:00. If you are staying on the Kohala Coast, this farm is a closer drive. On the windward eastern side of Oahu, there’s a macadamia nut shop and tropical farm, Tropical Farms . They offer a wide range of inventive flavored macadamia nuts for you to sample. They’re open daily from 9:30am to 5pm. See this map for directions. I love macadamia nuts but have never seen actual macadamia trees before. Very interesting. Hi Rach – I’m glad you liked seeing the photos. The tour I took was really educational. Tropical Farms on Oahu (across the street from Kualoa Ranch) offers free samples of various macadamia nuts, plus the parking is free too. They have a macadamia shell husker inside their store. You can’t eat just one. They have friendly local sales people there too. Hi Christian – Is Tropical Farms located directly across the road from Kualoa Ranch or a mile or two south? Is that also known as the Mac Nut Factory Outlet?